I really like the M.Asam Magic Fini (review here) so I am hoping this primer is just as good. I just rubbed a bit of it on the back of my hand and it seemed a bit 'wet' for a primer when I first applied it but afterwards my skin felt silky smooth. There is a perfumy scent to it that is a little strong. More so than the Magic Fini. I have had this in a subscription box before and I really liked it. Enough to trade some perfume samples to get my friends samples as well. I am going to use it tonight. My skin needs some brightening up right now! If I remember correctly this had a little tingle to it. 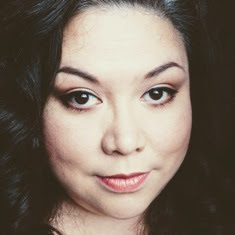 I have never tried the Color Extend products before. I do have colour treated hair and I am always looking for the “one” product that will knock my socks off. Will this be it? LOL I am not a fan of shampoo packets. They are messy to deal with. This month’s product card now has information where you can get these products. 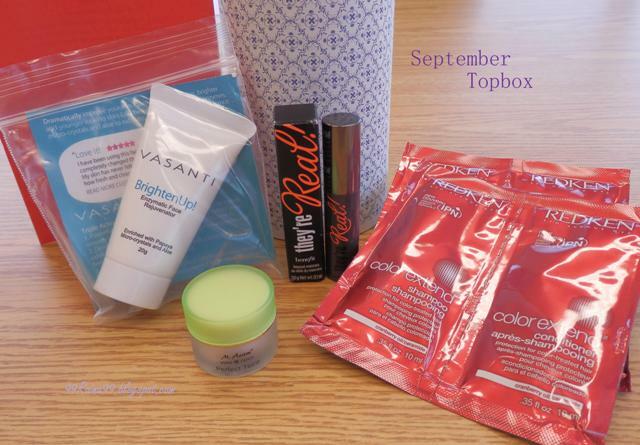 But my September’s Topbox covered everything from cosmetics, skin care to hair care. That’s all I ask for and that is why I love Topbox! Topbox is has a waiting list so if you want in you better sign up now! J As always, it is $10/mth for 4 premium beauty samples each month. You didn't get the offer? I thought it was on the back of everyone's product cards? LOL You made me go dig through my garbage to check. I thought maybe I missed it, but no the only thing on the other side of my product card is the word Topbox. Good thing because it had banana stains all over it HAHA. (God I hope it was banana) I am sure Holt Renfrew would have not liked that.